If too late to aid in furnishing matter for the work, which I am glad to know you now have in hand, I think I can tell you some interesting things. You ask for my ” Maryland family, ” but my investigations have been so directed to my father’s immediate line (which was not the eldest) that it would seem but fragmentary and incomplete to give you this as a satisfactory history of the clan. The name existed early in Maryland. One Francis Riggs was in Calvert County in 1663, acquiring no less than 2,300 acres of land, and died intestate in 1667, when his estates in the province were claimed by his first cousin, Joseph Riggs of Virginia. In the proceedings before the High Provincial Court the claimant set forth that his deceased cousin was son of John Riggs of Southampton (England), and that he, Joseph, was the son of Francis Riggs of Fareham, County of Hampshire (or Hants). (Fareham is a pretty market town at the northwest end of Portsmouth harbor, twelve miles southeast of Southampton and nine northwest of Portsmouth.) Of these two personages we learn no more, beyond the fact that Joseph established himself in Calvert County, and died there in 1671. In Virginia one John Riggs held land in lower Norfolk County in 1653. In 1689 Ensign John Riggs brought the official announcement of the accession of William and Mary to the throne to Nicholson, Lieutenant-Governor of New York. My earliest known ancestor was John Riggs. An old Baxter’s Directory, printed in 1672, which from internal evidence probably belonged to his wife’s (Davis) family, mentions his death August 17, 1762, aged 75 years. He was, therefore, born in 1687. On the 16th of January, 1721-2 he married, at St. John’s Church, Annapolis, Mary, daughter of Thomas Davis and Mary, his wife, who (as I know from the same Baxter’s Directory) was born January 9, 1702, and died December 13, 1768. John Riggs is first mentioned in 1716 in the will of John Marriott, of Anne Arundel County, who bequeathed to him 50 acres, part of a tract called “Shepard’s Forest.” In 1723 he had surveyed a tract of land called “Riggs’ Hills, “on the northern branch of the Patuxent River, near the present village of Savage, containing 200 acres, and in 1725 he purchased an adjoining tract containing 142 acres, known as part of “Rich Neck.” Both of these tracts were in Queen Caroline Parish. 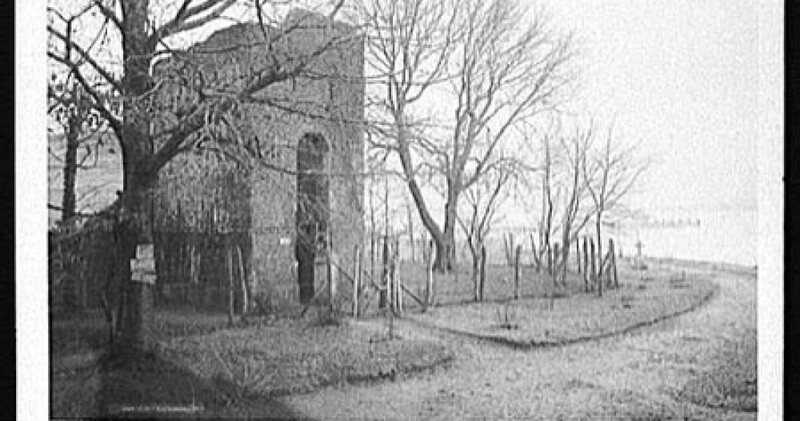 The church was near what is now Laurel, Howard County, and John Riggs was a pewholder in 1736. 1. Thomas, born October 20, 1722, died October 25, 1797. 2. Rachel, born June 11, 1724, married to Edward Warfield, October 6, 1741, by the Rev. James Macgill, at Queen Caroline Parish, died April 16, 1794, having had twelve children. 3. John, born July 11, 1726. 4. James, born April 13, 1728; was “Tobacco Inspector” for the Parish, September 6, 1736; was taxed, from 1756 to 1762, 300 pounds of tobacco annually as a “bachelor”; died August 14, 1780. 5. Ruth, born October 20, 1730, married Greenberry Griffith, had ten children, died October 18, 1779. 6. Mary, born September 24, 1732, married Benjamin Griffith, had eight children. 8. Ann, born July 29, 1738. 9. Samuel, born October 6, 1740, was also a Tobacco Inspector in Queen Caroline Parish, September 2, 1766-7, married in 1767 Amelia Dorsey. daughter of Colonel Philemon Dorsey, of Anne Arundel County, and Catherine (Ridgeley) his wife; died at his farm, part of “Bordley’s Choice,” near Brookeville, Montgomery County (formerly part of Frederick County), May 25, 1814, and is there buried beside his wife, who was born August 23, 1749, and died August 6, 1807. They had twelve children. 10. Elisha, born October 4, 1742, married Delila Hammond, served as Captain of Continental Militia in Colonel Edward Gaither’s Battalion, and died June 6, 1777, and had three children. 12. Amon, born April 21, 1748, married Ruth Griffith (died 1830, set. 83), December 21, 1769, died March 16, 1822, had nine children. 1. Mary, born August 14, 1768, married Henry Griffith. 2. Henrietta, born December 22, 1769, married Daniel Gaither. 3. Thomas, born January 12, 1772, married November 17, 1796, Mary, daughter of his Uncle Elisha (of John) Riggs, died January 10, 1845, and had issue; was an eminent merchant in Baltimore. 4. Anna, born August 12, 1773, married her cousin, John H. (of Elisha), died February 18, 1796. 5. Reuben, born May 23, 1775, married Mary Thomas, died April 25, 1829. 6. George Washington, born August 14, 1777, was a successful merchant at Georgetown, D. C, and later in Baltimore, Md., married first Eliza Robinson, secondly Rebecca Norris, widow, and had issue by both wives. 7. Elisha, born June 13, 1779, married first Alice Lawrason (of James), of Alexandria, Va., September 17, 1812 (who died April 16, 1817, aged 25), leaving two sons, and secondly Mary Ann Karrick (of Joseph), July 16, 1822. Was highly successful in mercantile pursuits in Georgetown, D. C, and later in New York City, where he died August 3, 1853; buried in New York. 8. Eleanor, born June 7, 1781, died August, 1804. 9. Romulus, born December 22, 1782, married Mercy Ann Lawrason (of James), sister of Alice (above mentioned), May 29, 1810. Was a prosperous merchant and well-known citizen of Philadelphia, Pa., where he died October 2, 1846, leaving issue. 10. Julia, born December 22, 1784, died 1862, unmarried. 11. Samuel, born June 14, 1786, died September, 1805. 12. Remus, born January 12, 1790, married Katherine Adams, and had issue, died December 18, 1867. 1. John Hammond, married his cousin Anna (of Samuel). 2. Mary, born May 23, 1776, married her cousin Thomas (of Samuel), died May 10, 1829. 3. Sarah, born 1777, died October 22, 1795, s.p. 3. Charles, born 1774, died 1802. 7. Joshua, born 1790, died 1810. 8 and 9. Two daughters. died September 25, 1823, had issue. 2. Samuel, b. August 20, 1800, married Margaret Norris. 3. Caroline Eleanor, born June 7, 1803, married Caleb Dorsey, died April 13, 1877. 4. Elisha, born July 6, 1810, married Avolina Warfield, died June 16, 1883. 5. Thomas John, born May 15, 1815. 1. George Washington, born at Georgetown, D. C, July 4, 1813, married at Madison, N. J., June 23, 1840, Janet Madeleine Cecelia SheddenBanker, died at his country seat, Greenhill, Md., near Washington, D. C, August 24, 1881. 2. Lawrason, born November 22, 1814, married first Sophia Crittenden (died without issue), secondly Frances Behn Clapp, thirdly Mary Bright, died October 13, 1884, leaving issue. 1. Samuel James, born September, 1811, married Medora Cheatham, of Nashville, Tenn., died July 4, 1847, s.p. 2. Amelia Dorsey, born 1813, married James P. Erskine, left issue. 3. Alice Ann, born 1815, married James W. Bacon, M.D., of Philadelphia, died February 21, 1839, leaving issue. 4. James Lawrason, born 1817, married thrice. 5. Mercy Ann, born 1819, died November 21, 1821. 6. Mary Elizabeth, born 1821, married Robert Colgate, of New York City. 7. Henrietta, born 1823, married Samuel G. Battle, of Mobile, Ala., had issue; lives in Philadelphia. 8. Julia Mandeville, born 1825, married George H. Boker, of Philadelphia, died 1899. 9. Illinois, married Charles H. Graff, of Philadelphia. So much for the first four generations of the family in Maryland ; more is scarcely needed for your purpose, and besides my notes are incomplete in the various branches outside my immediate family, in the later generations. 1. Thomas, of Fareham; buried at Fareham, 1638. 2. Robert, of Fareham, married Margery Chambers, of Southampton; his will proved 1644. 3. Ralph, three times Mayor, City of Winchester (Hampshire), married Mary Johnson, of Buckinghamshire; will proved 1647. 4. Francis, married Katherine Knight, died before 1636. 5. William, baptized at Fareham, 1593. 6. John, of Southampton, merchant, married Marie Blake Hopgood, 1626; will proved 1636. 7. Mary, baptized 1585, married thrice. 9. Anne, baptized 1596, married twice. 1. Robert, born 1632, ob. s.p. 2. Elizabeth, married Robert Coates. 3. Margery, married December 4, 1631, John Earlesman. 4. Mary, baptized February 27, 1629-30, married Sir John Otway, Knt. 5. Margaret, married Thomas Baker. 3. Thomas, married Constance Hook, of Hook, County of Southampton. 4. Edmund, of Winchester, will proved April 27, 1660, buried in Winchester Cathedral, married Margaret Savage, of King Clere, County of Southampton. 5. Ogle, married Mercy, co-heiress of John Lock, of Hollist, County of Sussex, died 1705, set. 69. 6. Mary, married Anthony Yelden, of Winchester. 1. Ralph, baptized at Fareham, April 9, 1657. 2. Constance, baptized at Fareham, July 29, 1650, married George Downs. 3. Thomas, baptized at Fareham, November 25, 1652. 1. Thomas, Captain in Royal Navy, married Anne Bettesworth 1748, died in South Carolina, s.p. 2. Ogle, born 1736, died February 5, 1773, s.p. 3. Mercy, died October 18, 1772. These names, representing several generations of the (English) family of Hampshire and Sussex, are to be found in “Berry’s Visitation of Hants,” and the “Visitation of Sussex” by the same author, somewhat amplified as to dates, etc., by my own searches and by a pedigree prepared for me at the Herald’s College, London, some years ago. I had prepared also a reference list of wills on record in England and abstractsfrom the wills of certain of the Southampton Riggs, but the latter were lost by a professional genealogist who attempted to fix the origin of my ancestor John. While my efforts have been unsuccessful in this, I have always felt convinced that our descent was from this Southampton and Fareham family. 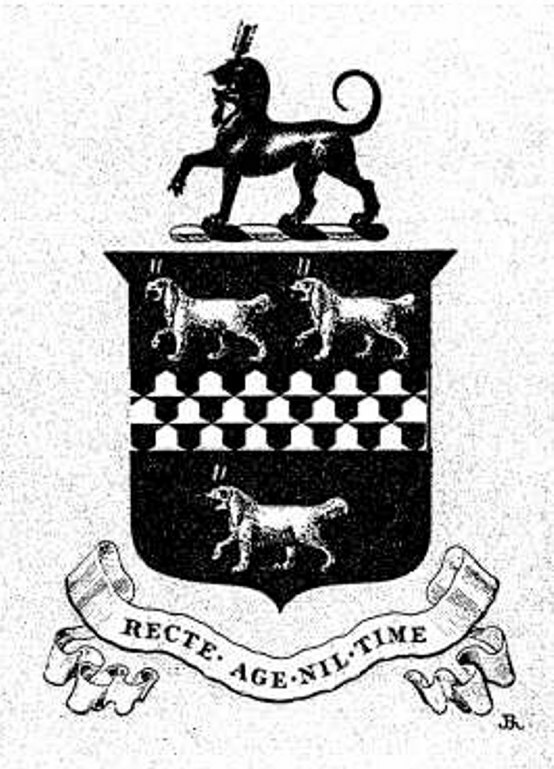 I have seen the parish church, Fareham, and in the chancel in a prominent place are the monuments of several of the family, with armorial bearings. The Manor House of Fareham, once held by the Riggs’ family, I was not able to identify. The arms, as given in Berry, of the Hampshire Riggs are: Gules, a fesse, vair, between these three water spaniels, argent, each holding in the mouth a birdbolt, or, plumed argent. Crest: a talbot, passant, gules, eared, or, holding in the mouth a birdbolt of the second (or) plumed argent. During the past summer I had some correspondence with a professional genealogist, Mr. Gustave Anjou, of 132 Nassau Street, New York City (or P. O. Box 2,611), who informed me that he had devoted years, to tracing the history of the family, in this country and in England. L have recently written to him asking if you might count on his aid, but he has replied that his records are only available on payment of a proper return for his labor and then not for publication. It may or may not be of value to you to communicate with Mr. Anjou. I may add that the pedigree I give of the Hampshire Riggs may be incomplete and that individuals are missing in it from whom the American emigrants were descended. Yours faithfully, E. Francis Riggs.